Assumption (population 1,261) is located in south-central Illinois about 35 miles southeast of Springfield and 20 miles south of Decatur. The town is located in east-central Christian County. U.S. Route 51 is the main roadway to and from Assumption. The Big George Branch River flows through the west side of town. An unknown railroad line travels from Assumption to its neighbor to the south, Pana. The history of the town of Assumption and its former high school are in need of further research. Assumption High School was probably established in the late 1800s. It served the community and surrounding farm kids through the early 1990s. It was in 1992 that consolidation talks were finalized with Assumptions's neighbor the north, Moweaqua. The result was the formation of the Central A & M School District. "The Assumption high school building became the Central A&M Middle School serving 6th thru 8th grades." Assumption HS team nickname: the "Comets"
Cause we know you have sand, Assumption High! Our brave Assumption High!... GO! 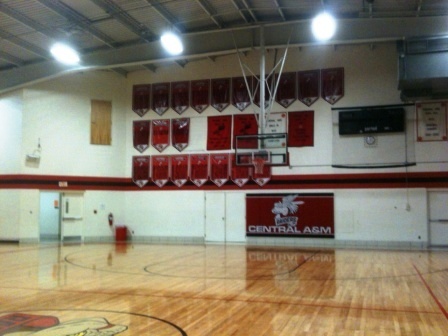 From Coach Bruce Firchau: "This gym picture is of Assumption High School that closed a few years ago. It is now the middle school for Central A&M and hosts events for the IESA. In 1979, Blue mound defeated Assumption (89-81) for the Meridian Conference Championship. By the start of the JV game the gym was packed. Some of "old historians" called this one of the greatest games in conference history. Seating capacity 1700." The Assumption High School athletic program enjoyed success on many different levels and in many different sports. The boys competed in baseball, basketball, football, and track while the girls were offered basketball, softball, track, and volleyball. We are searching for many of the particulars regarding the AHS athletic teams. The Assumption High School thinclads had some nice individual efforts to go along with a strong program. The team of 1909 finished NINTH in the IHSA State Meet. Team accomplishments and individual medalists are listed below. 1908-09 Team Finished NINTH in STATE MEET Competition!! ?? Harpole Long Jump STATE CHAMPION!! The baseball program won a Regional title. This is currently the extent of the information we have regarding this sport. "I was coach of the 77-78 team and I think we were 5-4. Since we were a small school we had to share our players with track. The 78-79 season the baseball team finished 14-3 and won a share of the Meridian Conference Championship. The first in school history . I believe Maroa, Niantic and Assumption ended in a three way tie. We lost the sectional championship to Decautar St. Theresa 8-7 in 9 innings (a loss that still hurts today) Our only losses were to Kincaid, Niantic and St. T. St. T advanced to the quarter finals that year. Major players on that Comet team where Dan Himes pitcher/short stop who later played baseball and basketball at Mac Murray College, Paul Adcock catcher/pitcher who later played at Northeast Louisianna. Though apparently not winning any IHSA hardware, the basketball program lists some nice season records on the IHSA website (www.ihsa.org). Assumption's Cheerleaders won the Cheerleading competition in both 1977 and 1978. "I researched Assumption basketball history going back to the 1920's. As I remember they had outstanding teams in the 20's and 30's, but could not get past the Witt(Speed Boys) in state playoffs. Later, they ran up against the Taylorville(Tornadoes). Dan Himes scored over a 1000 points and Paul Adcock scored over 900+ in their careers as Comets. Today Dan coaches the Central A & M basketball team at Mowequea." The football program also had some great seasons. The team qualified for the IHSA playoffs on three ocassions and had some incredible season records as well. 10 - Number of interceptions by Jim Manley in 1979, which set the school record. It was tied by Curt Mink in 1987. 11 - Games in 1985 in which Steve Zuber rushed for over 100 yards. 23.1 - Rushing average (yards per carry) by Todd Hutchens in 1987; another school record. 293 - Number of rushing yards allowed by the Assumption defense in entire season of 1985, which is fifth best in Illinois H.S. Football history. 380 - Yards ran on punt returns by Hutchens from 1986 to 1987; another school record. 633 - Total yards allowed by the Assumption defense of 1985, which is third best in Illinois H.S. Football history. The lady netters had a nice early run in volleyball. Coach's names and records of the better teams are listed below. If you have any informatiion you can provide regarding the above listed girls sports please contact us at eganann@sbcglobal.net.